How great is this tent canopy for a boy's bed? Finally it is not all about the processes and the boys can have some imaginative fun too! 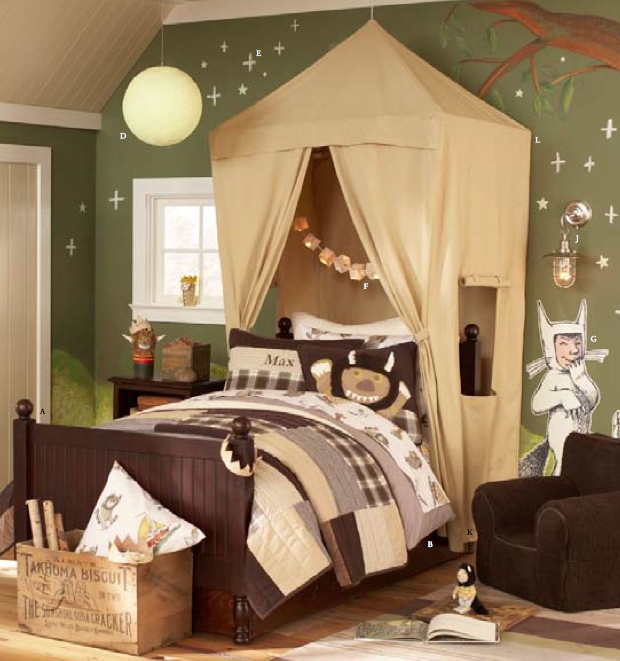 This playful tent will be available from Pottery Barn Kids July 11th when their fall line debuts. It is adorable, but I can't seem to find it on their website or anywhere else on the Internet. Any ideas? I've called customer service multiples times about this canopy tent, as I have purchased all of the other items for this room. The only two I need are the Max decal and that tent. I have yet to get a straight answer about when this tent will be available. The one straight answer I was able to get was that it will be available in October or November. All of the other reps I've spoken to haven't had any pearls in regards to this tent. It's quite aggravating that I received this catelogue almost a month and a half ago but some of the items are not available yet and may not ever be available.